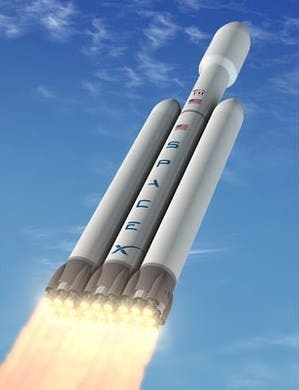 Space Exploration Technologies, the company that is reshaping the space industry, plans to announce the development of a massive 22-story rocket, the Falcon Heavy, whose power is rivaled in the U.S. only by the Saturn V rocket, which took man to the moon, built by rocket pioneer Wernher von Braun who oversaw the development of NASA's Apollo missions. The Saturn V was 350 feet tall and had twice the lifting power of the Falcon Heavy. The 27-engine booster, which has twice the lifting capability of the next largest launcher built by a U.S. company, is being assembled by rocket maker Space Exploration Technologies Corp., or SpaceX, at its sprawling complex in Hawthorne, CA where it has some 1,100 workers. It's goal is to to launch military and commercial payloads into orbit. "We're embarking on something that's unprecedented in the space industry," Elon Musk, the company's chief executive, told The LA Times. "This is territory that has only belonged to the U.S. government — with its tens of billions of dollars." SpaceX hopes to launch it in a demonstration flight from Vandenberg Air Force Base, northwest of Santa Barbara, at the end of next year. In December, SpaceX became the first private company to blast a spacecraft into Earth's orbit and have it return intact. Launches on the Falcon Heavy would cost from $80 million to $125 million. The company is paying for development costs of the rocket, Musk said, in anticipation that if it builds it, customers will come. The unmanned flight was intended to show NASA that SpaceX could handle the task of carrying cargo into space. Facing severe buget cutbacks, the U.S. government is expected to turn to private industry to play a bigger role in building rockets, carrying cargo, running space missions and possibly carrying astronauts to the International Space Station. SpaceX, which operates more like a hungry Silicon Valley start-up than an oldline rocket builder. has a cadre of brilliant young engineers — the average age is in the early 30s — who work for a fraction of the salary they could make at larger aerospace companies. Musk, 39, came from the Silicon Valley. He started SpaceX after making a fortune when he sold online payment business PayPal Inc. in 2002. "The best and brightest want to work for them right out of school," said Jay Gullish, a space and telecommunications analyst told the LA Times. "They're doing things that in the private sector has never been done before." Musk envisions a day when the Falcon Heavy not only launches satellites but also carries robots and astronauts to Mars. "Other than the Saturn V, this is the most capable launcher in history," Musk said. "When this thing goes off, it will be pretty epic." Image credit: An artist's rendering of the Falcon Heavy. Space Exploration Technologies.